← Food Trucks in Raleigh for August “First Friday” & Food Truck Rodeo at North Hills Monday August 6th! Picture of the Week – Grilled Cheese Cook-Off in Raleigh! 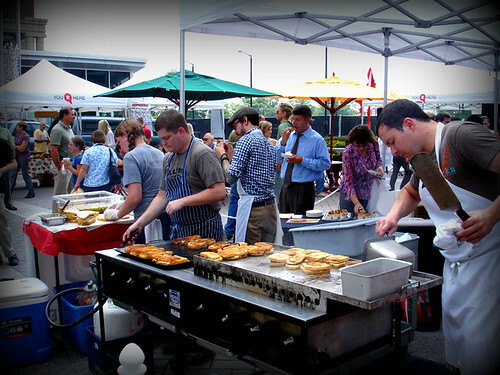 This week’s photo was snapped during the Grilled Cheese Cook-Off in downtown Raleigh. The event took place during the Wednesday afternoon farmers’ market in City Plaza using cheese from triangle area cheese-makers. You can view the rest of my photos from the grilled cheese cook-off in my flickr photo album. woulda been fun… but glad i didn’t make it… i wish restaurants/chefs would come to realize there is a contingent of us out here that CANNOT STAND goat cheese… and that’s all they are using these days in their creations! …used to think i was the only one until i did some googling a couple of years ago and found forums full of fellow peeps with goat cheese aversion… wish i liked it, just don’t, and learned from a goat cheese maker that there is about 5% of the population with some sort of gene that I have that makes my disdain a ‘real’ one! Thanks for sharing your thoughts. I have to admit I am not a huge fan of goat cheese myself. I only tried a few of the creations at the Cook-off last week. Not sure how many of them featured goat cheese, but I am pretty old school and tend to favor a sharp cheddar myself! Thanks for checking out my blog! Grilled cheese is a classic. Had one this weekend myself. Home-made, with Kraft American. Worked for me, but that grille filled with sandwiches makes my mouth water! Mike, Cheese & butter are my weakness! One of these day you will have to try a grilled cheese from the American Meltdown food truck. They have one that includes buffalo chicken. It is incredible!